The Nick Jr. program ran from 1994-1998. Thank you for continuing to support Black History Month. I enjoy celebrating BHM on my blog because there are so many excellent Christmas episodes, specials, and TV movies with exceptional African-American cast members. There are also loads of outstanding and touching Christmas TV story lines aimed at black audiences. During the month of February each year, I like to highlight just few of my favorites. Hopefully, you've been following along all month long on social media as I've been sharing special BHM content from the archives. Today, I want to highlight one more significant Christmas program, one that draws upon the cultural heritage of the Gullah, the African-Americans that live along the coasts of South Carolina and Georgia. 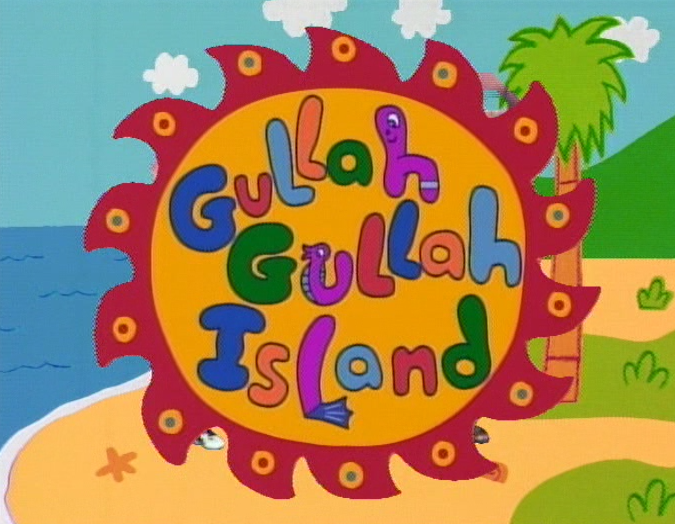 Did you grow up watching the Nick Jr. program Gullah Gullah Island? 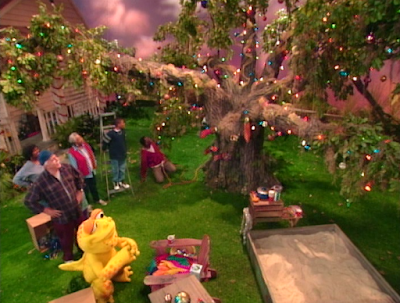 Because of the warm climate, the Alston family decorate the tree outside their home. 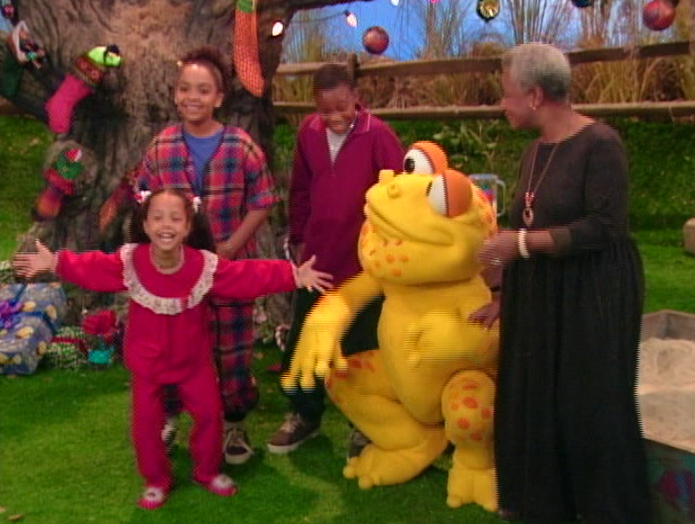 Like many other Nick Jr. programs, the songs are presented in such a way to encourage children to sing along. Here, the music reflects the sounds of the island, often with a Caribbean and African influence. 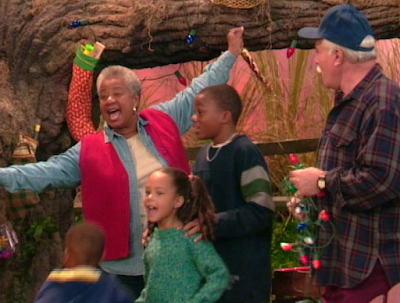 The fourth season of the children's live action series features the holiday story "Gullah Gullah Christmas." It's Christmas Eve and the Alstons are busy decorating their tree. Caught up in the spirit of the season, they sing "Deck the Halls" as they hang ornaments and wrap the branches in lights. Young Shaina wishes she could visit the North Pole and meet Santa Claus. Shaina wonders about the distance to the North Pole. about Mrs. Claus, what the elves are doing. 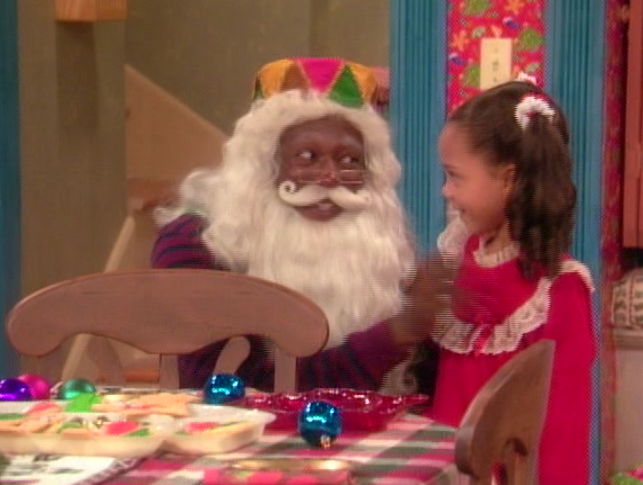 Shaina finds herself with Binyah Binyah at the North Pole. After drifting off to sleep, Shaina finds herself at the snow-covered North Pole. She meets Mrs. Claus and admires her garden that grows Christmas ornaments. The two sing "Jingle Bells" as they pick ornaments from the garden in order to adorn the reindeer' bridles. Mrs. Claus sure is friendly, warm and nice. She looks familiar too! Bossie and Elf-Ves. It's no coincidence that Bossie resembles Shaina's brother James. Shaina also meets the elves who are busy packing Santa's sleigh with gifts. 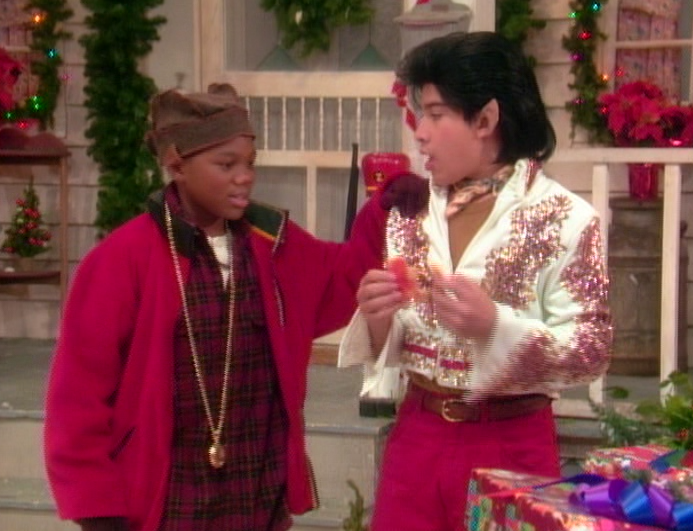 The head elf's name is Bossie and his assistant is Elf-Ves (yes, an Elvis-inspired elf). The elves take a break from working to sing "Up on the Housetop." Shaina is excited to finally meet Santa Claus! He's so full of holiday cheer that together they sing "We Wish You a Merry Christmas." Santa is happy to meet Shaina. The reindeer are suffering from severe head colds. 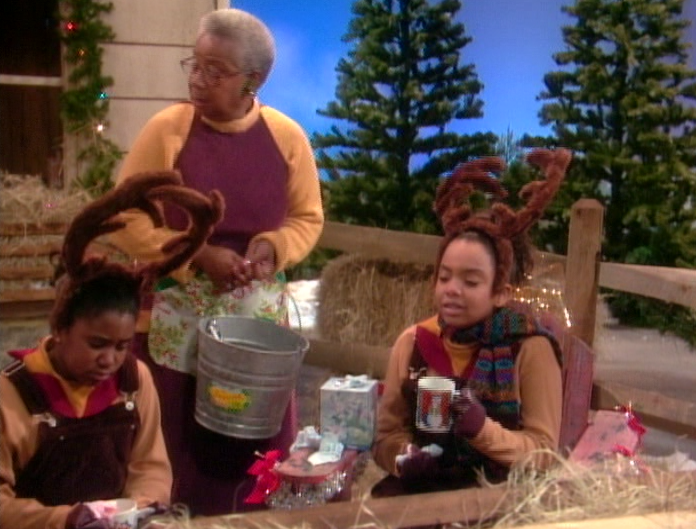 Trouble comes when the reindeer--all stricken with head colds--decide they are too sick to pull Santa's sleigh. Shaina has the solution to save Christmas! 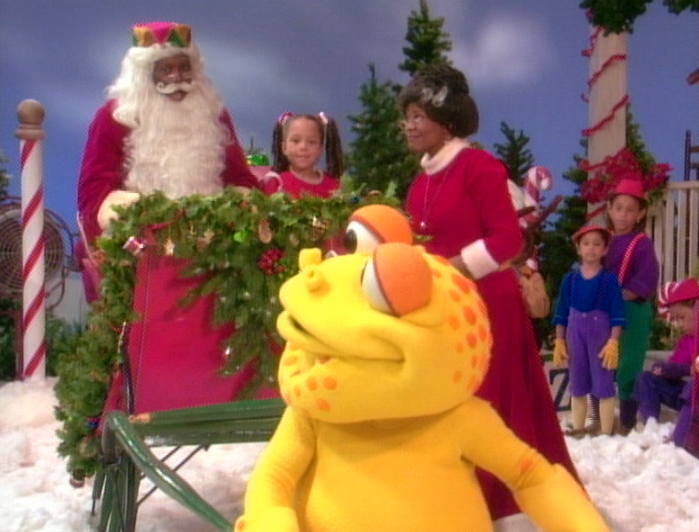 She suggests that Binyah Binyah can pull the sleigh--and Santa agrees to give it a try. With a little bit of encouragement, Binyah Binyah hops high enough to fly the sleigh across the sky. The elves chant "Hop to it, you can do it!" to encourage the polliwog. Shaina wakes up on Christmas morning, happy to share her experiences at the North Pole with everyone. Vanessa is convinced that Shaina was dreaming, but when the little one finds the Christmas tree ornament in her pocket that Mrs. Claus gave her, Shaina knows the truth. As the family celebrates the day together, they sing the original song "Merry Christmas To Ya/It's Gullah Gullah Christmas Time." 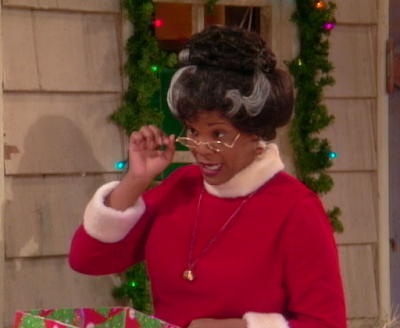 Shaina experiences some Christmas magic when she finds the ornament from Mrs. Claus in her pocket. 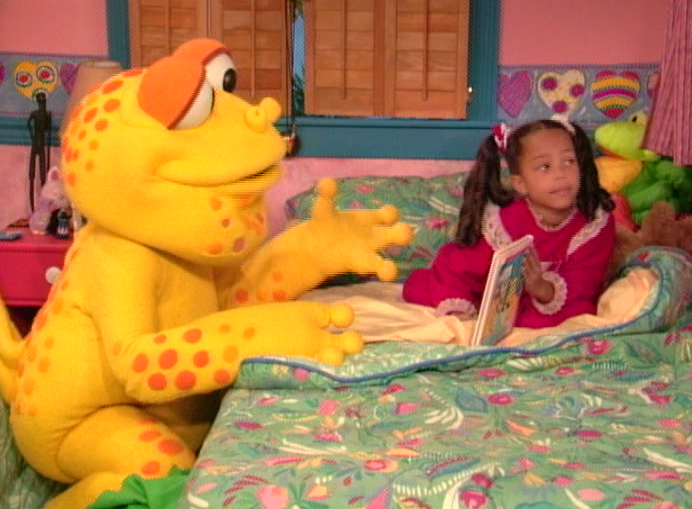 Did you watch other Nick Jr. programming in the 1990s? What were your favorites--and did they have a Christmas episode? The simple yet heart-warming story is a charming one for young viewers. One thing about it that resonates with me is that Shaina's experiences at the North Pole resemble her waking life--I love that the North Pole resembles her own residence, Mrs. Claus looks like her mother, Bossie the elf is just like her bossy brother James, and the reindeer are all suffering from head colds this Christmas just like her cousin Vanessa. My dreams typically work like that too. I find that delightful. Of course, I also love how the culture of the Gullah is represented here, and the Christmas music reflects the influence of Caribbean and African sounds. How long has it been since you've seen this Christmas program? Feel free to leave your comments below. Know something? A little girl having a Christmas dream and the people at the North Pole looking like her family? This episode has an exceptional similarity to a fellow Nickelodeon show, "The Busy World of Richard Scarry" with its episode "Sally Cat's Christmas Dream".